Dedicated Solutions Review 2019: Is Dedicated Solutions a Good Hosting? DedicatedSolutions will proide you with a quote for the exact services you require for your websites. Their specialty is an uptime of 100% and an easy-to-use cPanel. They have a different support staff for each region and respond to your support tickets within the hour. DedicatedSolutions is a web services provider that is present in five different countries of the world, namely U.S.A., Germany, Austria, Ukraine, and the Philippines. Apart from these five office locations, they have three different datacenter locations with more to be added soon. They excel both in hardware and software aspects of web hosting and are therefore quite a good choice for website owners. DedicatedSolutions is one of the few service providers that guarantee 100% uptime. They ensure this through the multiple carriers at each of their data center locations. As these datacenter locations increase in the future, their service is only going to get more reliable. They also ensure that you are up and running inside thirty minutes, which is quite awesome. They also offer hundred percent ‘Automated Remote Reboot’ and a hundred percent ‘Automated OS Reinstallation’. The updates and support are included in each package as is reactive and proactive monitoring. 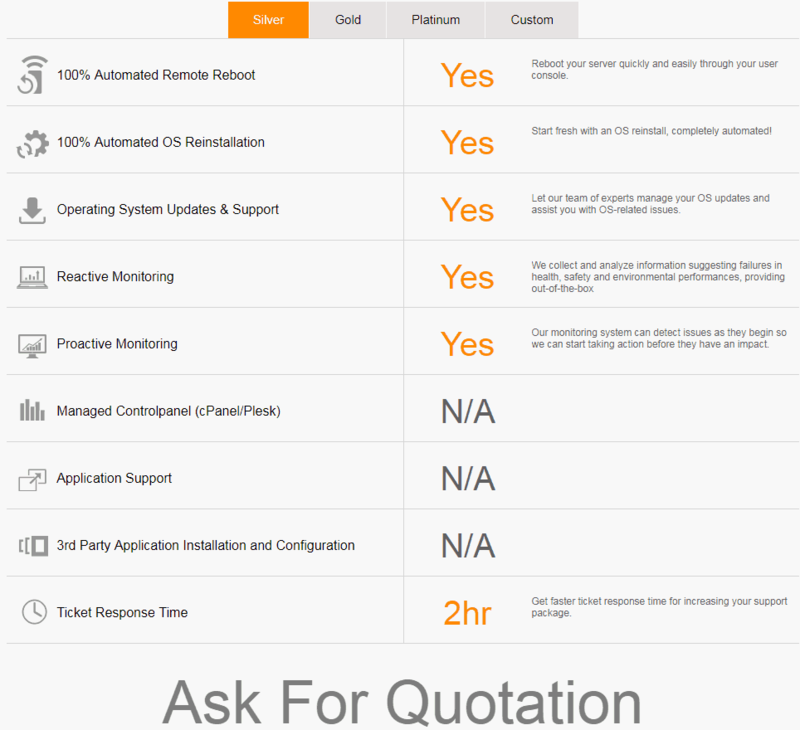 They offer cPanel and Plesk control panels in all packages except the basic package called Silver. In order to avoid downtime for crucial e-commerce applications and websites, they incorporate multiple geographical data centers. In addition to providing dedicated resources and high security, this enables them to ensure high availability and faster loading of webpages, which at the end of the day pays dividends in terms of search engine rankings. In a similar way, multiple load balanced servers provide benefits of their own. You can ask them for custom solutions through support. DedicatedSolutions do not display prices for their packages on their website. You can ask for a quotation for each of the packages they are offering. All the four packages clearly list the exact services offered so you just have to choose the one that suits your requirements and ask for a quote. Their support is divided into different teams for different regions which helps them ensure a 24/7 availability for customers around the world. You can call them using a toll-free number or send them an email through the website. They guarantee a response within one hour which clearly shows they have a dedicated support staff in place. They also have a live chat button on their website but as I clicked on it, I realized there wasn’t any link behind that button. That is quite unprofessional as they should remove the button if their live chat service is down or not available. If you are already a customer, you can even get a response within fifteen minutes depending on which package you are using. Guaranteed response within fifteen minutes to an hour. Wondering how Dedicated Solutions stacks up against other Web Hosting companies? Enter any other Web Hosting company and we will give you a side-by-side comparison.